Considering the United Nations Ruling on tenant eviction in Spain. We will not tolerate any more evictions! On June 20th we learned that the United Nations Committee on Economic, Social and Cultural Rights (ESCR) stated that eviction of tenants without a housing alternative, under its current regulations, constitutes a violation of the Human Right to Adequate Housing. The Committee judged a case of eviction by termination of the rental contract of a room, taking place in 2013 in the district of Tetuán in Madrid (Spain), which ended with a family of four sleeping in a car. Neither the Municipal Social Services nor the Housing Institute of the Community of Madrid (IVIMA, by its Spanis acronym) nor the Court itself prevented the eviction; neither did they provide housing for a family unit with two children aged 1 and 3 years old at the time1. The conclusions of the United Nations point to State responsibilities with implications for all of its government levels, from municipal social services, unable to attend something as basic as a family’s right to adequate housing, to the Congress of Deputies2, responsible for a procedural legislation that turns the courts into management offices for the housing market without even allowing judges to take into consideration the situation in which the people who are going to be evicted are left. As we have denounced after hundreds of thousands of evictions since 2009, in Spain there is a structural violation of the Right to Housing enshrined in the Declaration of Human Rights and in the Spanish Constitution of 1978, with irreparable social damages for the most vulnerable sectors of society. This horrific outlook of social emergency has led the Platform for People Affected by Mortgages. (PAH) and the housing movement in general to organize to stop thousands of forced evictions and recover thousands of empty apartments from financial institutions to turn them into homes. In doing this, we have verified that the struggle for the Right to Housing relates to people with mortgage, indebted, evicted, renting a house, working without fixed contract, squatting, inhabitants of self-constructed homes and homeless people, bringing us all together in the face of abuses of a ruthless housing market3. In this regard, the victory of the Madrid family that has sued the State with the result of this legal sentence is also a victory for the whole movement. This reaffirms our reasons and makes civil disobedience campaigns (such as #StopDesahucios = StopEvictions, Obra Social to rehouse people in empty bank-owned apartments and others) and proposals to change unjust laws (such as Popular Legislative Initiatives and #LeyViviendaPAH = PAH Housing Law) more necessary than ever. Our proposal for a Housing Law that includes several of the United Nations recommendations will be discussed in Congress in September. In this context, the PAH will demand that all congressmen and congresswomen take a stand on compliance with Human Rights in housing, as we have demanded every day in the streets for the past eight years. We will not tolerate any further evictions! Platform for People Affected by Mortgages., July 6, 2017. 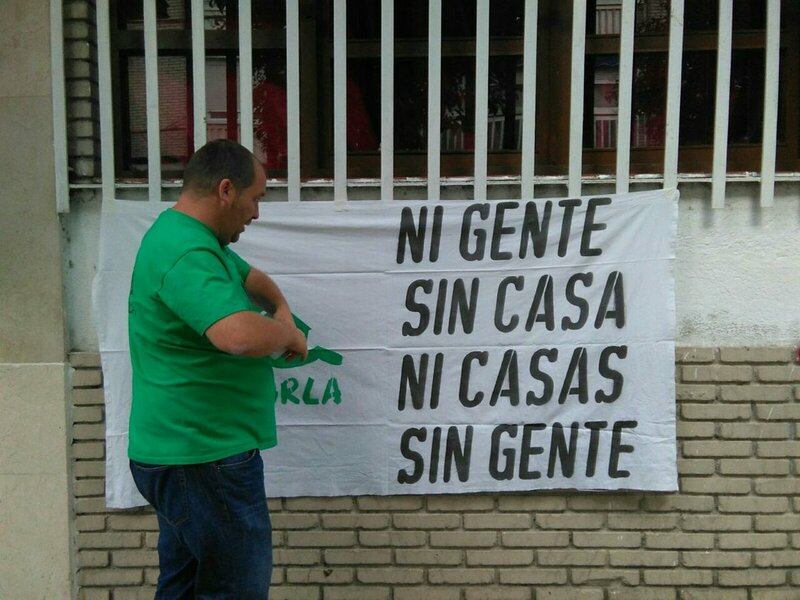 1 The UN points out as particularly glaring the inaction of Madrid’s autonomic authorities, which claimed lack of enough housing to protect this family (and thousands of others also evicted in the region), while at the same time public housing was sold to international capital vulture funds. See ruling, paragraph 17. 2 Constitutional body representing the Spanish people. 3 The Spanish government claimed via its representative in front of the United Nations that rental contracts among individuals are extraneous to the State’s responsibility, which may not interfere in “private” business. The Spanish government denied as well any wrongdoing, going so far as to claim that the rental market is not subjected to international Human Rights law.